DrEvil why stop with May? said on May 31 @ 5:31am I like how the baby doesn't seem to notice the stache at all. Terry Masters said on May 31 @ 10:08am Hey man, you've been great all month. I just want to thank you for all the great comments and the sense of fun you've brought to this all month long. And great job yesterday as well. AND on top of it all, you've got a beautiful family! See you next year! haleryan said on May 31 @ 10:27am i second both James C's comment and Terry's comment. James C is usually an idiot, but he managed a coherent thought this time around. Terry's usually drunk but that only makes him more charming. haleryan said on May 31 @ 10:28am by the way, i give you the unofficial spirit award. Terry Masters said on May 31 @ 10:34am i take issue with that. i'm not usually drunk. i'm ALWAYS drunk. get your facts straight, Ryan. Jeez! Melina said on May 31 @ 12:30pm CUTE!!! Zach said on May 31 @ 1:31pm You are the wind beneath my wings. thanks for the great pictures & comments zach! wah said on May 31 @ 1:53pm Awesome job on all your pictures Chris. Not only did you have perfect picture attendance, but you were the most prolific comment poster. I second Ryan's nomination of you for the Spirit award. Zach said on May 31 @ 2:15pm I'll third that motion. chris said on May 31 @ 2:23pm guys yall are very kind to say those things...i just did what everyone else did. Zach said on May 31 @ 2:30pm You should totally do whiskerino when it comes around again. chris said on May 31 @ 2:34pm i plan to..as long as my wife is cool with me being like that for a few months. i wanted to do it this past year, but due to the birth of my 2nd daughter, i didn't want her to see her daddy as one thing & then all of a sudden not have a beard. Mr. Ash said on May 31 @ 3:10pm you're contagious! 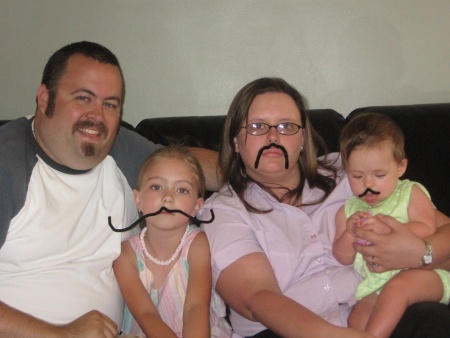 Sethro said on May 31 @ 7:34pm great stache, great fam. nice having you on, chris. Zach said on May 31 @ 7:56pm Whomever gave this a one-block should not, I repeat not, get the spirit award. Sweet Stache said on May 31 @ 8:58pm As my wife said, "that's really funny." She's right. You rule. Mason Bernard said on May 31 @ 11:23pm is there a spirit award ? Zach said on May 31 @ 11:35pm There damn well should be.